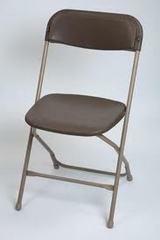 Our neutral folding chairs are our most economical chair. The seat backs and seats are a neutral plastic color with matching color legs. They are made with an anti – sink bar on the back legs preventing the chair from sinking into the ground keeping your guests comfortable and safe from embarrassment. Great for festivals, concerts, picnics, and backyard events. We can accommodate any size event, regardless of its theme. We pride ourselves on being the most reliable and trustworthy rental company in the area, which means our chairs are always in great shape and our customer service is unmatched in the industry. We’ll work with you to make sure that your guests will be comfortable in any setting, whether they’re outside or indoors. We even consider the fine details like having special pads on chair legs so that your floors will not get scuffed during indoor events. For more information about the chairs rental options we offer for events in Lafayette area contact Bouncing Buddies today.